Our AOV control panels have been specifically developed to provide a flexible solution to smoke ventilation control. 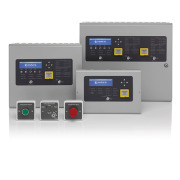 With all vent controls and indications located on the front of the control panel, available models include 3, 5 or 10 amp PSU versions for control of small, medium and larger loads. Developed utilising the same detection circuit technology as our EN54 approved fire control panels, this new AOV range offers a wide choice of peripheral connections for the installer to use as required. The high spec models include all the available inputs and outputs in a single, off the shelf unit and no additional modules or cards are required. As if that wasn’t enough, we have also ensured our false alarm management software has been included in every panel as well. The flexibility and ability of these control panels is set to excite the market place for both new developments and maintenance of existing systems helping to ensure building compliance going forward.